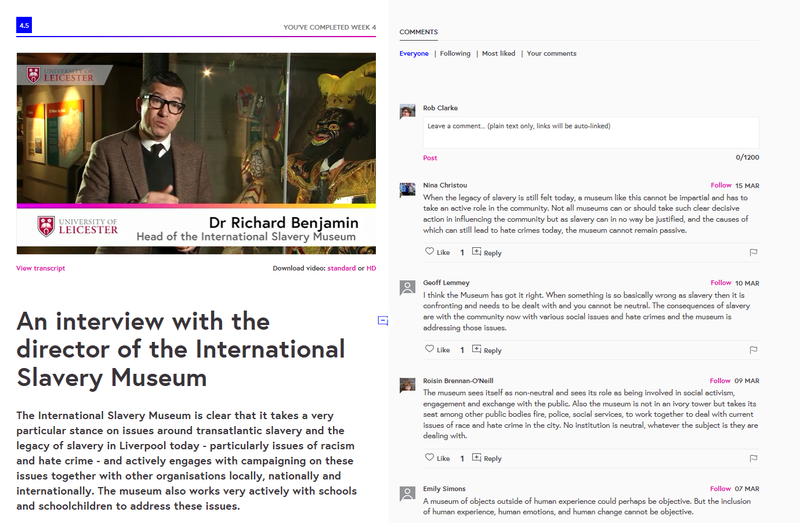 Behind the Scenes at the 21st Century Museum is a Massive Open Online Course (MOOC) created by the University of Leicester (School of Museum Studies and Leicester Learning Institute) with National Museums Liverpool in partnership with FutureLearn. The course was aimed at museum staff and volunteers, people interested in undertaking further study in the field of Museum Studies as well as interested members of the general public. It sought to engage with people wanting to understand more about how a museum operates in the 21st Century, the topics and areas of work that 21st Century Museum might engage with and the issues faced by museum staff and volunteers in providing a range of services to the public. 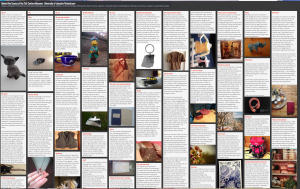 This shows a typical page from the MOOC containing text, a video and learner comments. The course, which was divided into six weeks, each requiring a minimum of two hours study, covered a range of topics including museum design and architecture, audience development, emotions and ethics in the museum, how a museum can contribute to issues around social justice and human rights, support the health and wellbeing of individuals and communities as well as exploring the key assets of a museum: objects and people. 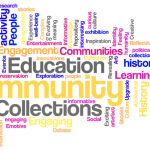 Each week consisted of academic research from the University of Leicester and case studies supplied by National Museums Liverpool, demonstrating the connection between research and practice and the positive impact that the museum can have. It enabled learners to engage with both world-leang research and cutting edge museum practice. Content was presented to learners in a variety of forms including articles and images, videos, narrated slideshows and audio content. Most content was created specifically for this MOOC and had not been seen before. A key strand of the course, as with any MOOC, is the participatory and social nature of the learning experience. 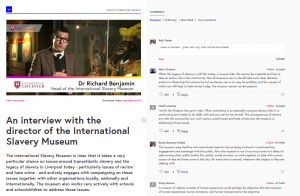 Learners are actively encouraged to engage in conversations using the discussion boards and offer their own thoughts and opinion on the issues being discussed as well as commenting on other social media using the course hashtag #FLMuseums. In addition, specific activities encouraged users to take part in polls, collaboratively develop word clouds, and post thoughts and pictures to ‘Padlet’ walls, imitating online a feedback mechanism used in one of the case studies for Liverpool’s Walker Art Gallery. Physical accessibility was considered through ensuring compliance with best practice in terms of the online environment, much of which is taken care of by the FutureLearn platform (screen reader compliance, alt texts for images, resizable texts, accessibility on desktop, laptop and mobile devices etc.) and alternative formats were supplied when required (e.g. supplying photographs with text descriptions as a PDF document to accompany an online slide show, an audio described version of a PowerPoint presentation, ensuring that all videos were subtitled and that all audio and video assets had downloadable transcripts). An example page showing an image and text. 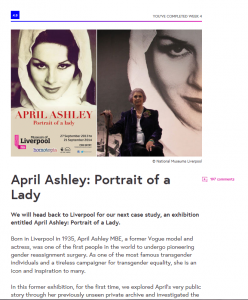 This page examined the Museum of Liverpool’s April Ashley: Portrait of a Lady exhibition, which documented the life of April Ashley and explored issues faced by the transgender community. 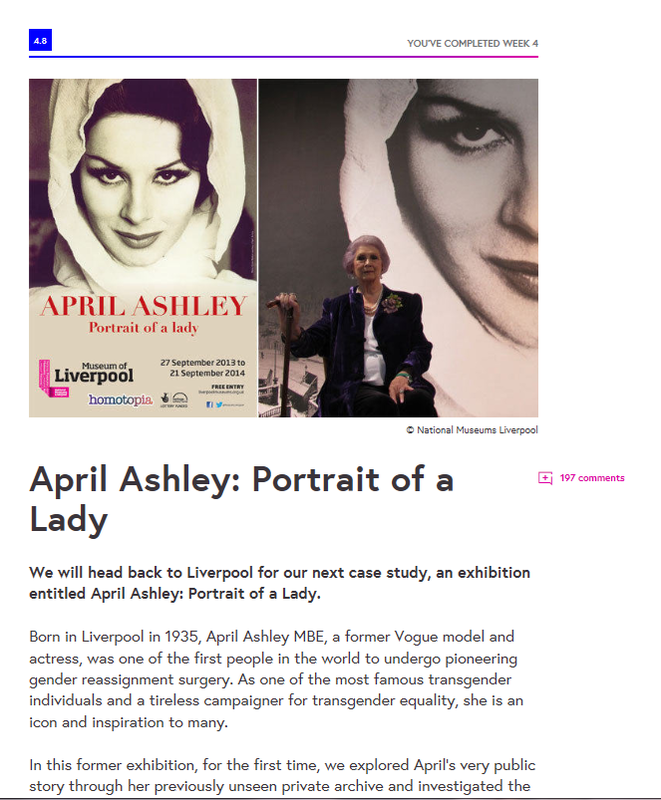 In addition to considering physical accessibility, and in line with the ethos of both the School of Museum Studies and National Museums Liverpool, we were keen to ensure broad representation of different communities, the issues they face and the way in which museums can engage with such issues and communities. These included, for example, issues of immigration, issues faced by people with disabilities and issues faced by the LGBT* community. These were explored in terms of academic research in the field and case-study examples of initiatives that seek to support disadvantaged and/or underrepresented communities. In many places across the world, and very notably in the UK, museum budgets are being cut. Often budgets for training and continuing professional development (CPD) are the first to be cut. Given the current climate in much of the museum sector, we wanted to offer an opportunity for museum staff to undertake CPD through engaging with exciting contemporary research and practice and to offer this within a social learning environment in which museum staff and volunteers could discuss issues both with colleagues and other course participants. 17,897 people signed up for the course (runs 1&2). 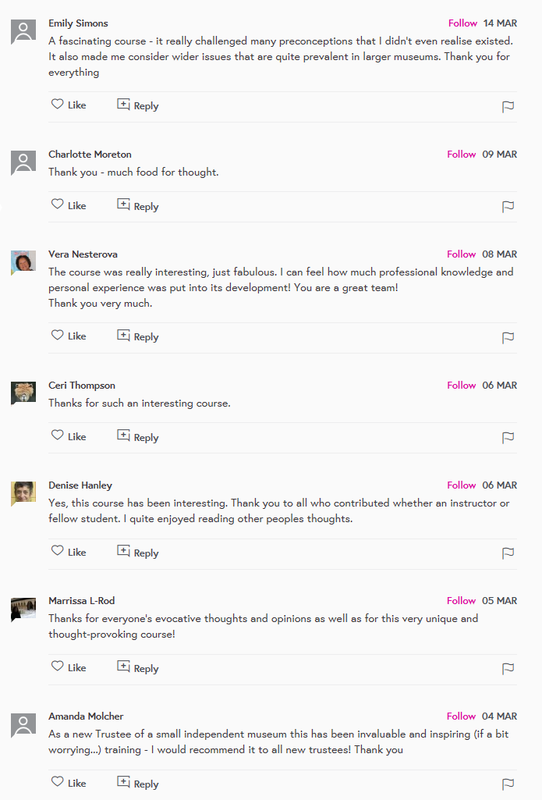 Some of the comments left at the end of the course. Learners were invited to submit three words to describe museums. These were there three words in week 1. Learners were invited to repeat the ‘3 words’ exercise from week 1 to compare how attitudes had changed. This is the word cloud from week 6. In this first week, we will think about what it means to be a 21st Century Museum. This will include an exploration of issues such as architecture and design, community collaboration and how a museum can use digital technology to reach out to people beyond the physical walls of the museum. By the end of week 1 learners will be able to discuss the notion of a ‘museum’, demonstrate how the quality of a museum might be measured, explain different elements involved in constructing a 21st century museum. During the course of this week we will look at the research of colleagues at the School of Museum Studies into the barriers that people face when it comes to visiting or engaging with museums, and look at some potential solutions. We will also see case studies from National Museums Liverpool, which show how the Walker Art Gallery sought to engage with one under-represented audience group. This week we will explore the ‘emotional museum’. We will think about how people respond emotionally to particular objects and exhibitions, whether it is always right for museums to set out to shock or provoke, or elicit particular emotional responses, and what ethical considerations a museum might make when it does so. We will assert that it is these emotional responses to objects, displays and stories that make museums well placed to tackle some of society’s most difficult issues. By the end of week 3, learners will be able to discuss how people engage emotionally with a museum, with objects and with stories, explain how museums can/should consider the emotional responses of visitors / service users in constructing displays, exhibitions, projects etc, debate ethical issues surrounding the provision of emotive content in a museum context. This week we build on this thinking as we look at some leading-edge research and work in the area of museums, social justice and human rights. We will consider what areas of work in this field it is appropriate for museums to engage in (racism and hate crime, disability discrimination, homo- and transphobia and more) through a variety of rich and inspiring case studies. This week we continue our exploration by thinking about the health problems faced by today’s society and how museums might be able to support the health and wellbeing of their communities. We will offer lots of background information on health and wellbeing, a framework to help us understand how museums might be able to become involved in this work and some case studies of work that is currently going on in this field. By the end of week 5 learners will be able to describe how museums can contribute to public health and public health agenda, discuss the benefit of using museum objects in therapeutic work, give examples of museum projects that contribute to health and wellbeing. Learners were invited to submit photographs objects that they felt expressed something about them and explain why. This week we will explore behind the scenes of the museum even further, by looking at how we approach objects as museum practitioners and audiences, and interpret them. We will also meet some of the people that shape the 21st Century museum today and open up some conversations about how you might be able to get more involved with museums in many different ways. By the end of week 6 learners will be able to describe the various roles and functions of a modern museum workforce, reflect upon the purpose of the 21st century museum, explain some of the challenges facing a 21st century museum, discuss how the MOOC has affected your opinions (if at all) on the purpose of the modern museum. The course was widely marketed using social media as well as being promoted on the FutureLearn website. Both the School of Museum Studies and National Museums Liverpool actively promoted the course to students, partners and other stakeholders both via email and using promotional postcards. The course was picked up by museums associations in a range of countries including the Asia-Europe Museum Network, for example. 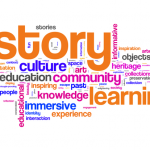 The UK’s Museums Association ran an article on the MOOC to coincide with the launch date. Tweets and other social media posts were shared by associations in Australia, America and a range of European countries. Specialist museum sector networks also promoted the course including, for example, the Social Justice Alliance of Museums and Museum Development networks throughout the UK. Blog posts were created and posted by all partners and further posts were written by learners and other interested organisations, which were further promoted via social media before and during the course runs. Pitching content to an unknown audience. The course had no entry requirements, so had to cater for participants with a range of backgrounds and educational and professional achievements and experiences. Engaging with learners. With thousands of learners it is impossible to engage on an individual level, but learners still want to feel a level of engagement with educators. Monitoring discussions. Thousands of comments were posted and it is difficult to check these for factual accuracy in order to correct errors or misconceptions or answer learner queries. Ensuring content was presented in a straightforward, easy to understand way using language that was accessible to learners who are non-native speakers of English and learners who do not regularly engage with academic content. Ensuring content and educators are, as far as possible, representative of different potential audiences. Allowing leaners to discuss and debate, often correcting factual errors or misconceptions within the learner community without requiring educator engagement on specific points. Creating in-week responses to content including videos and emails. These were created during each study week and responded to specific discussion points and comments raised by learners. Behind the Scenes at the 21st Century Museum was highly successful from the point of view of all three partners, the University of Leicester, National Museums Liverpool and FutureLearn. The course engaged with thousands of learners and led to high levels of new (or renewed) engagement between learners and all of the partner organisations. Extremely positive feedback indicates that the course was also highly regarded by learners and that learners succeeded in achieving the learning outcomes of the course, with many reporting that the course has given them new perspectives on their work. Demand is such that the course will run for a third time starting in June 2016. The course is not currently running, so detailed content is not publicly accessible. We can facilitate access for reviewers upon request.